Services for Marjorie Hofer will be 11am Friday February 15, 2019 at the funeral home. Spring burial will be at the Groton Union Cemetery. 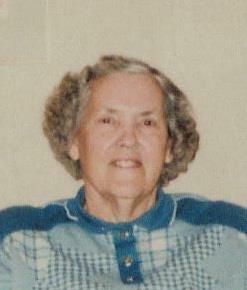 Marjorie Hofer loved being with people. Her family. Her friends. She loved to laugh with everyone. Marjorie was born November 26, 1918, to John and Meta Malcolm. She spent most of her childhood in Custer, South Dakota, the second youngest of ten brother and sisters. Marjorie married Everett Hofer in 1938. During the 71 years they shared, she was always “doing.” She liked working in her garden, painting projects, mowing grass, and helping Everett on the farm. She was in Extension Club and active as a 4-H leader. And she loved going every week (for 40 years) to the Bath Coffee Group with longtime friends from the community. She was also active in her church throughout her life, as a Sunday school superintendent and later as a first reader conducting the church service. Marjorie and Everett traveled to all of the 50 states and spent several months each winter in Phoenix with their daughter Trish. Some of Marjorie’s happiest moments happened, though, when her young grandchildren came to visit and play. They had her full attention and always got treats. Marjorie is survived by her three children: Sharon (Larry) Wheeting, Edward (Margaret) Hofer and Patricia (Ted Corley) Hofer. She also is survived by four grandchildren: Cheryl (Randy) Walker, Lauri (Dan) O’Hara, John (Chris) Wheeting, and Eric (DeeAnn) Hofer. She is preceded in death by her 3 sisters and 6 brothers, her husband Everett, and her two granddaughters Teresa Wheeting Sharp and Lisa Leafgreen Hofer. Besides her immediate family, Marjorie was able to know and love her great grandchildren--Kirstin, Alicia, Meagan, Karri, Todd, Amanda, Lindsey, Errol, Ashley, Brandon, Lauren, Brittany, Abbie, Spencer, Carly, and Olivia. That relationship also extended to two step great grandsons, Tyler and Riley. And she met and hugged 16 great-great grandchildren. Marjorie had a long and happy life—one to celebrate.